The latest patch for action MOBA Smite dropped today, adding achievements, a brand new god, a revamped store interface and all sorts of item and god balance tweaks. Great! I’ll just watch this menu animation for the two dozenth time then. As much as I enjoy playing the free-to-play PC (and soon Xbox One) game, there are moments I feel like I have much more fun watching these silly menu bits and collecting skins. Sometimes I log on just to flip through the menu screens to check for new animations. Other days I pop on and just go through each god, trying on every skin. 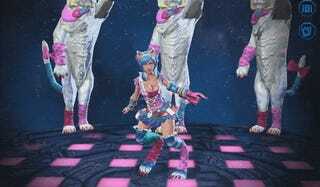 My favorites are ones like this Kawaii Pop skin for Bastet, which not only changes her look but her behaviors as well. I’m sure Ah Puch, the horrific god of decay, is lovely, and achievements sound like the sort of thing worth checking out as a guy obsessed with ticking off boxes. But none of that matters until I master the dance of the mighty cats.